Visit Wally's house, it's next door to the gym. Talk to his father to receive the coveted HM03 - Surf. 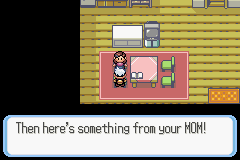 Since you're so close, you're obligated to visit your Mom in Littleroot Town. She'll give you the very useful Amulet Coin upon finding out you've defeated your father in a gym battle. Whenever a Pokémon holding an amulet coin is switched into battle you'll receive double the prize money. 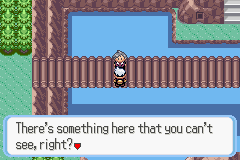 Our goal is to make it back to Mauville City, but there's quite a few useful things you can pick up along the way. 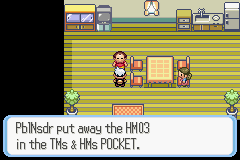 Teach the HM to one of your Pokémon and Surf across the lake in Petalburg City to find an Ether in an item ball. 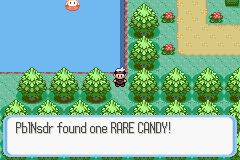 The little cranny on the east side of the lake has a hidden Rare Candy, be extra sure to pick that up! Head North towards through Petalburg Woods and on to Route 109 and surf across the lake instead of taking the bridge. Hop off to the left and pick up a PP Up in an Item Ball. Continue north through Rustboro City and sail North on the beach here. 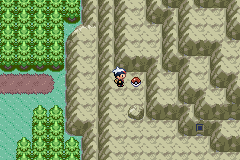 You'll find a small area of Route 115 that you weren't able to access without Surf. 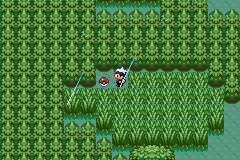 There's two trainers here for you to battle as well as a patch of grass containing a few rather rare Pokémon. 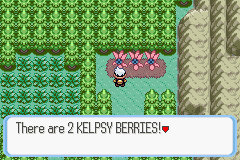 Grab 6 Kelpsy Berries from the bushes above and TM01 - Focus Punch in an Item Ball on a cliff to the east. If you have the Mach Bike you can also pick up an Iron in an Item Ball on an upper level of the same cliff. Continue your trek to Mauville by heading east from Rustboro through Rusturf Tunnel. 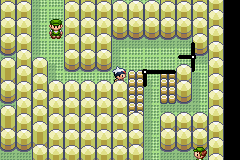 One more Route east from Verandurf Town and you'll finally reach your destination of Mauville City. 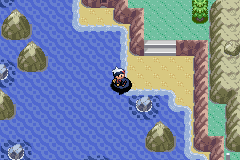 Take some time to heal up before heading east via surfing onto Route 118. Cross the small body of water to the other side. 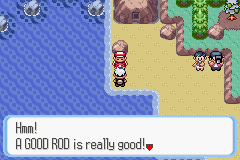 Talk to the Fisherman here and answer yes to his question to get the Good Rod. 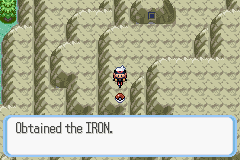 Press "A" on the southwestern rock to grab an Iron. Feel free to talk to the interview crew here and defeat them in a double battle for another interview and T.V. appearance. 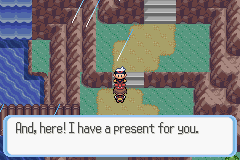 There's one more trainer before you'll be greeted by Steven, who won't do anything of significance. Use cut on the tree here and grab the 4 Sitrus Berries before heading East. 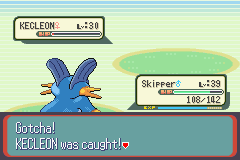 There's two trainers with bird Pokémon here and an Item Ball containing a Hyper Potion. Go east from here onto Route 123. 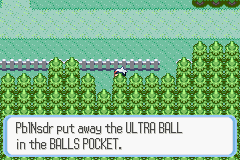 Grab the Ultra Ball below the fence here from the Item Ball and head over to the berry patch west of the building. 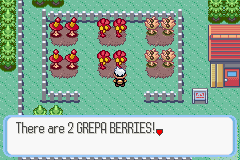 Defeat the trainer and feel free to pick any of the 8 Pomeg, Grepa, and Qualot Berries here. 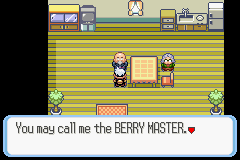 Inside the house are the Berry Master and his wife. The man will give you a few rare berries on a daily basis and the wife will do the same if you tell her certain phrases.For more info on this, check out our Berry Guide. 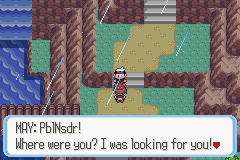 Exit the Berry Master's house and defeat the set of twins to the east before heading back to Route 118. 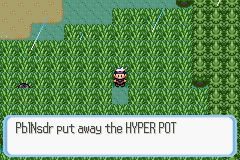 There's tall grass scattered all over Route 119, and you won't be able to ride your bike through it. 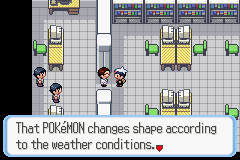 It also slows you down on foot and you can encounter wild Pokémon in it. 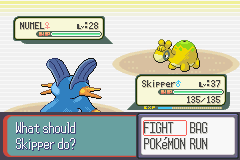 There's six trainers in this first section of grass, most of which use bug Pokémon and are avoidable if you so choose. 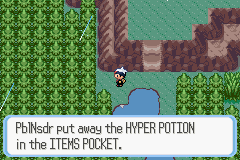 Make sure to grab the Super Repel to the west and a Hyper Potion to the east from Item Balls. 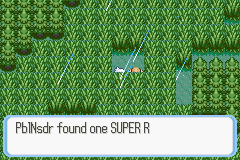 Surf across the body of water you find after exiting the tall grass. 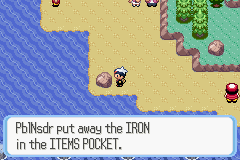 Defeat the fisherman here and head north to find a Zinc in an Item Ball. Back on the other shore is a house with a man standing outside of it. It's full of Wingullls and not much else, but check it out anyway if you're so inclined. Proceed north. Defeat the trainer before the bridge and then cross it. Follow the path and take the westernmost fork in the road when you come across it. 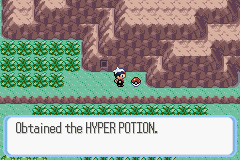 You'll find two trainers here as well as a Hyper Potion in an Item Ball. Now head East (or North with the Mach Bike) and picking up the Elixir on your way if you desire. 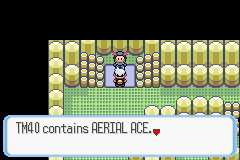 After two more trainers you'll reach a rather large building with two Team Magma/Aqua guards nearby. 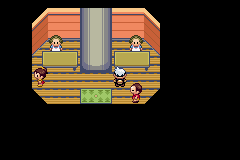 Head to the top left room and you can heal your Pokémon by sleeping in the bed here. Use the PC here to make sure you have 5 or less Pokémon in your party. 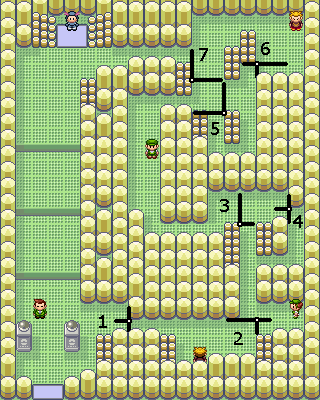 There's two Team Magma/Aqua grunts on the bottom floor to defeat before heading up the stairs. 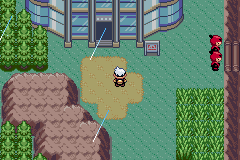 Defeat two more grunts on this floor before challenging the Admin to a battle. The Admin is only slightly more challenging than the grunts, you'll have no problem taking her down. 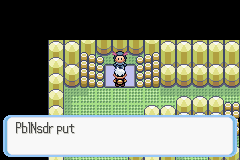 The scientists here will award you with a Castform for helping them out. Heal if you need to and head outside. When you cross the bridge and head north you'll be stopped and challenged to a battle by May/Brendan, who should be much easier to defeat than last time. 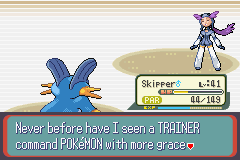 Your rival will give you HM02 - Fly before flying away themselves. 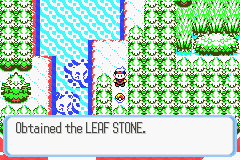 Head south and surf until you find an Item Ball that contains a Leaf Stone. 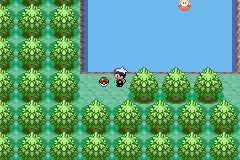 Head north past the bridge and defeat the two trainers who are disguised as trees. Pick up the 6 Pomeg Berries before entering Fortree City to the east. Heal up at the Pokémon Center and buy/sell anything you might want from the Poké Mart. 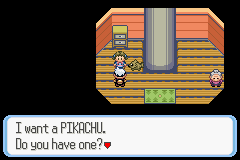 If you happen to have a Pikachu and want to trade for a Skitty, the kid in the house closest to the Pokémon Center is willing to make the trade. 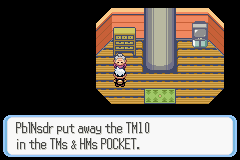 In the next house answer the old lady's questions correctly (right, right, left) and she'll give you TM10 - Hidden Power You can buy things for a Secret Base (check out our Secret Base Guide for more info) from the southeastern most hut, all the rest are good for only conversation. If you try to enter the gym you'll find it's being blocked by "something unseeable". 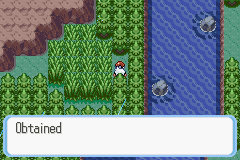 Exit Fortree City to the east and defeat the two trainers and cross the bridge to talk to Steven. He'll use something that makes the "unseeable thing" visible, and it's a Lv30 Kecleon You'll want to catch this, as it's a very rare Pokémon. After you catch or defeat it, Steven will give you the Devon Scope, the device he used to make it visible. 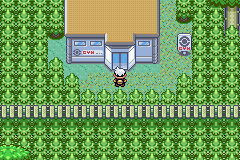 Head back to Fortree City and make preperations for the gym. Heal up and buy any potions or other items you think you might need. 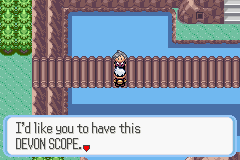 Use the Devon Scope to remove the Pokémon blocking your path and then enter the gym when ready.